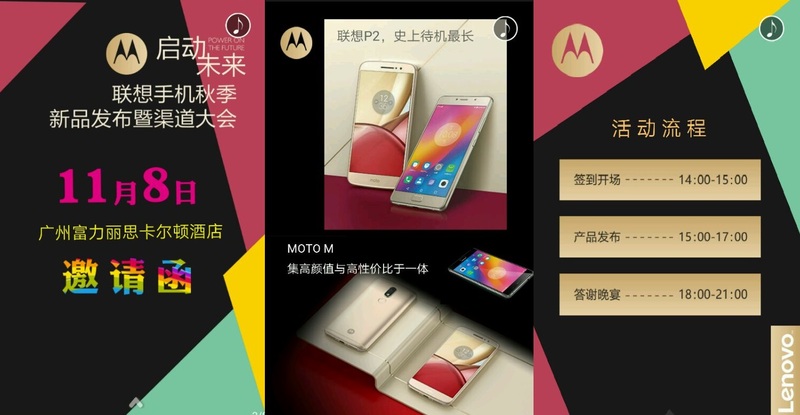 According to new reports we got today, The rumored Motorola Moto M and the Lenovo P2 will get unleashed on November 8, 2016 in Guangzhou, China. The Lenovo P2 was displayed back at IFA 2016 with a massive 5100mAh battery. Other Specs of the Smartphone includes a 5.5-inch 1080p display, 3GB RAM paired with 32GB ROM. The Device features a 13MP rear and 5MP front camera. The Moto M codenamed Kung-Fu which we leaked multiple times, to come out with a full HD 5.5" display, a MediaTek Helio P10 processor with 4GB of RAM, and a 16/8MP camera set up. Its model number is XT1662 and runs Marshmallow.